Mary Berry was born in Bath and when she finished college she wanted to register at Le Cordon Bleu. She developed a passion for cooking from her mother. It wasn’t until 7 years later that her boss sponsored her to join Le Cordon Bleu. Now 77 years old, charming blue-eyed Mary Berry, is a lady of the culinary world. She has written more than 70 books read by millions of people around the world and has built a reputation of providing simple recipes with fresh ingredients for the family. She has also participated in many culinary television series. She is currently a member of the jury for the televised competition the Great British Bake Off. 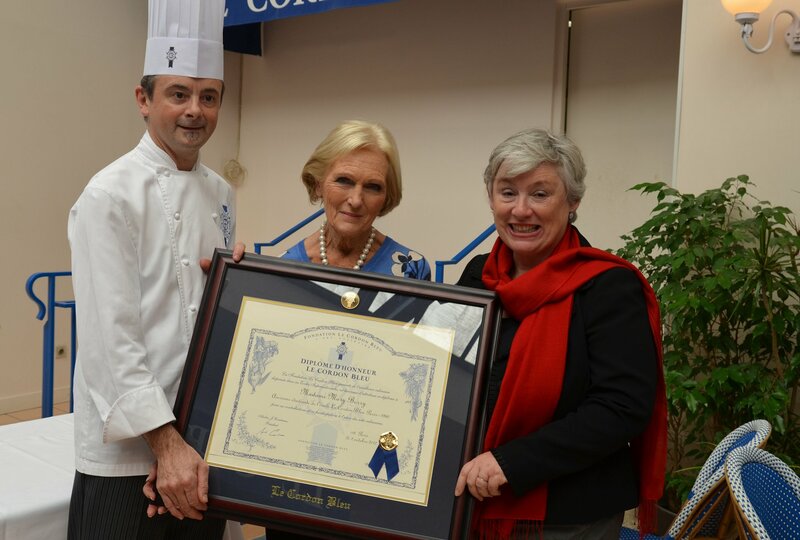 Le Cordon Bleu was honored to welcome Mary to the school in presence of Lady Ricketts, wife of the Ambassador of United Kingdom to France who is a fan of Mary. She received an Honorary Diploma from Le Cordon Bleu to thank her and as an appreciation for her vocation and contribution to the culinary arts. Mary was astonished with the size of the premises of the current school. During her visit she told the students: “When I was at Le Cordon Bleu in 1960, the school at rue du Champ de Mars was very small, we had very little space and no windows. Madame Brassart was very strict and we had to speak French! (N.R. courses are now translated into English at Le Cordon Bleu Paris). We even had an oral in examination in French…You are so lucky to be here!”.